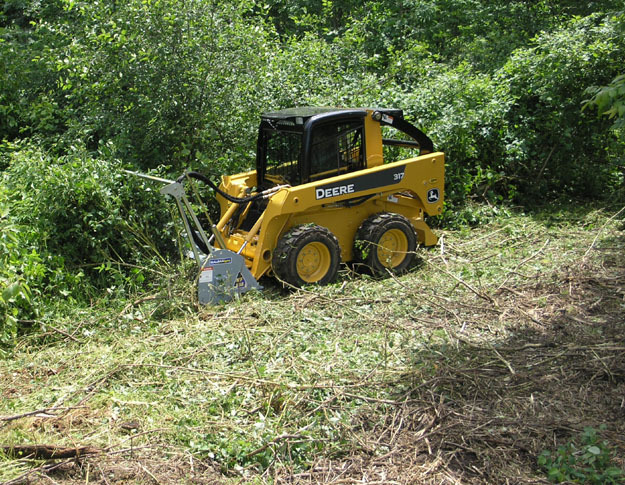 The brush mulchers are used to prepare areas for reseeding, or for just grinding and mulching the ground cover to reduce it especially in overgrown or wooded areas. 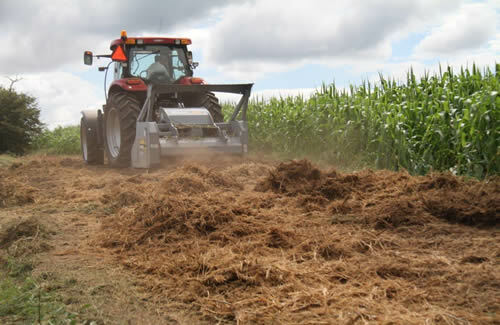 The brush mulchers are available in both hydraulic powered skid loader models, and three point hitch tractor mounted, pto powered models. 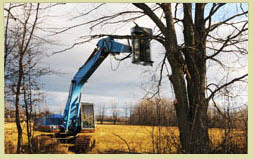 The Brush Mulchers mulch vegetation and tree limbs up to approximately 6.5 inches in diameter depending upon the model. 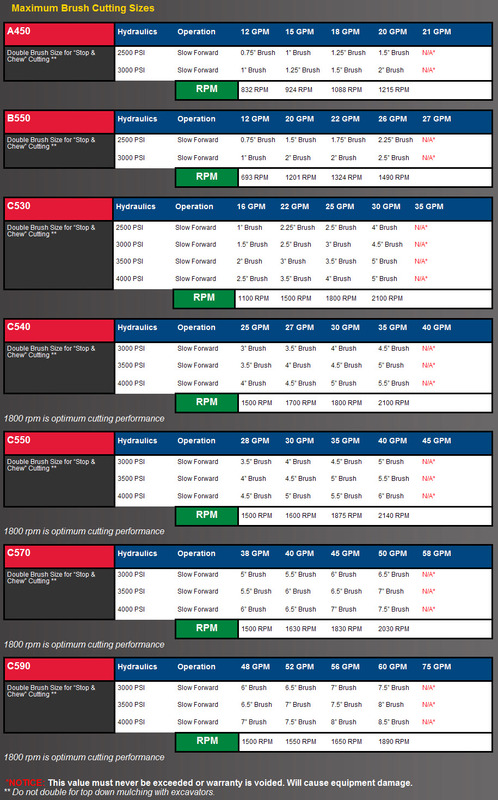 Models are available for skid loaders with hydraulic flow as low as 12 gpm. 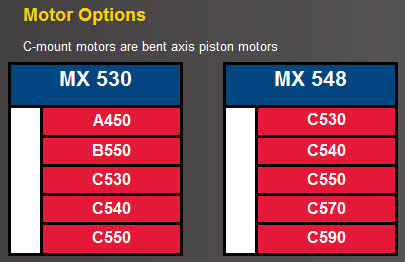 There is also a model available for mounting on excavator and backhoe arms. 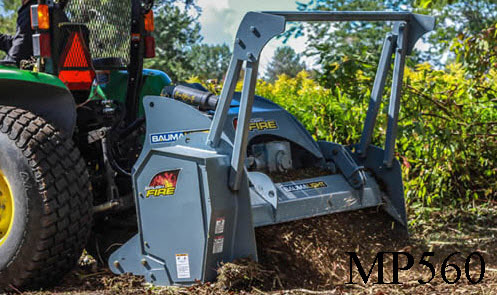 Model MS348: Cuts a 48 inch wide path in brush up to 2 inches in diameter, uses 60 carbide toothed cutters, mulcher has built-in relief valve, unit weight is 950 lbs. - Click the link below for the current price, and/or to order. 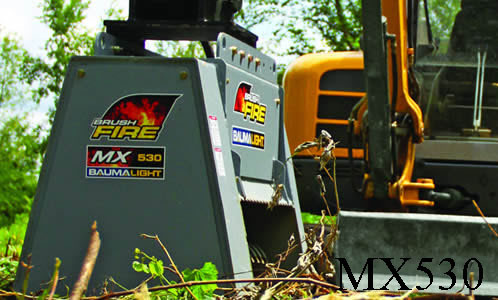 The Brush Fire 500 Series models mount on your skid loader with univeral quick attach connection, and on low; units are available with low, medium, and high flow hydraulic motor options. 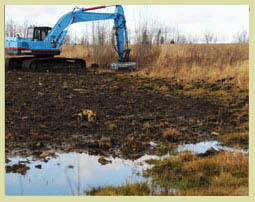 The hydraulic system on these mulchers is designed with flex couplers to prolong life by protecting the motor bearing. 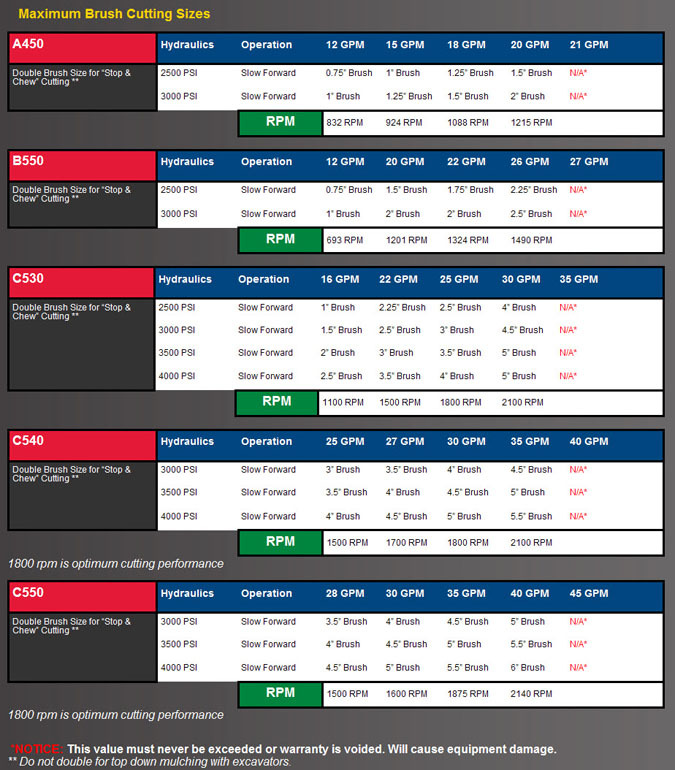 The super strength timer belt is designed to drive the rotor without slipping, while the builit-in relief valves protect the system, all without the need to stop and change a shear pin. 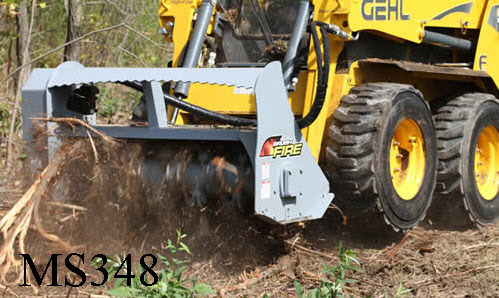 The hydraulic driven Brush Fire mulcher allows the skidsteer to move slowly if the terrain and obstacles demand it, without compromising the clearing performance. 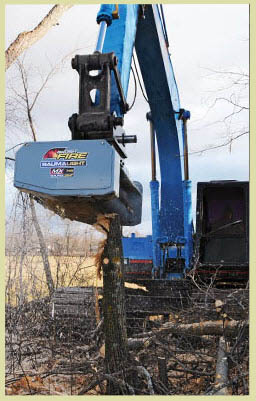 Model WLMS548-A450: Model MS548 mulcher with A450 hydraulic motor, requires 12-19 gpm hydraulic flow, no case drain required, hydraulic couplers included, 48 inch cutting width/blade width, 62 inch total machine width, wt. is 1490 lbs. -Click the link below for the current price, and/or to order. Model WLMS548-B550: Model MS548 mulcher with B550 hydraulic motor, requires 12-25 gpm hydraulic flow, requires case drain, hydraulic couplers included, 48 inch cutting width/blade width, 62 inch total machine width, wt. is 1490 lbs. - Click the link below for the current price, and/or to order. 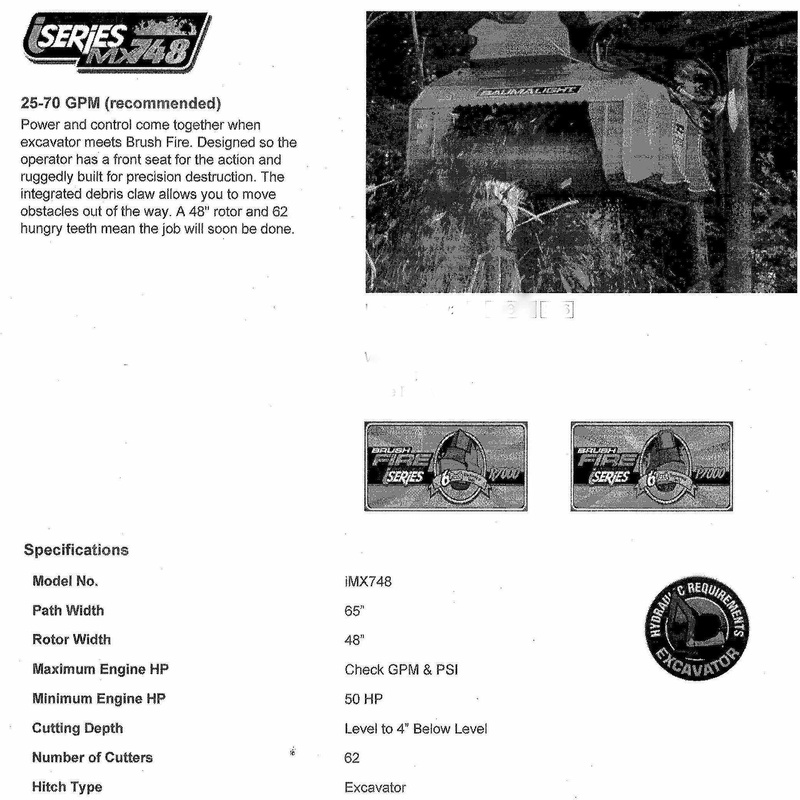 Model WLMS548-C510: Model MS548 mulcher with C510 hydraulic motor, requires 12-22 gpm hydraulic flow, requires case drain, hydraulic couplers NOT included, 48 inch cutting width/blade width, 62 inch total machine width, wt. is 1490 lbs. - Click the link below for the current price, and/or to order. Model WLMS548-C530: Model MS548 mulcher with C530 hydraulic motor, requires 16-30 gpm hydraulic flow, requires case drain, hydraulic couplers NOT included, 48 inch cutting width/blade width, 62 inch total machine width, wt. is 1490 lbs. - Click the link below for the current price, and/or to order. 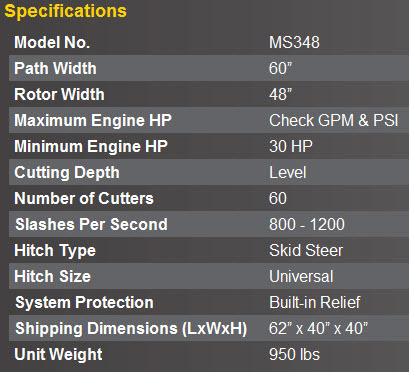 Model WLMS548-C540: Model MS548 mulcher with C540 hydraulic motor, requires 25-35 gpm hydraulic flow, requires case drain, hydraulic couplers NOT included, 48 inch cutting width/blade width, 62 inch total machine width, wt. is 1490 lbs. - Click the link below for the current price, and/or to order. 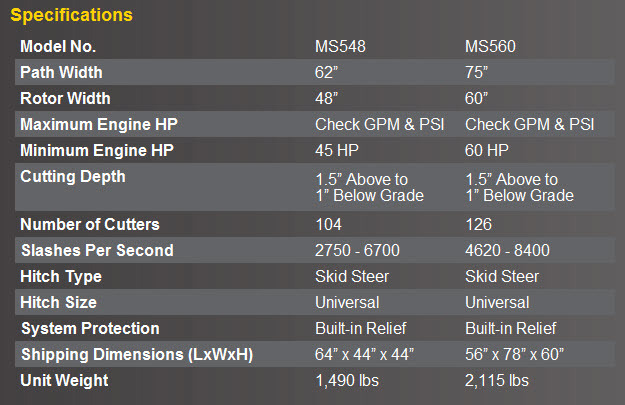 Model WLMS560-C530: Model MS560 mulcher with C530 hydraulic motor, requires 16-30 gpm hydraulic flow, requires case drain, hydraulic couplers NOT included, 60 inch cutting width/blade width, 75 inch total machine width, wt. is 2115 lbs. - Click the link below for the current price, and/or to order. 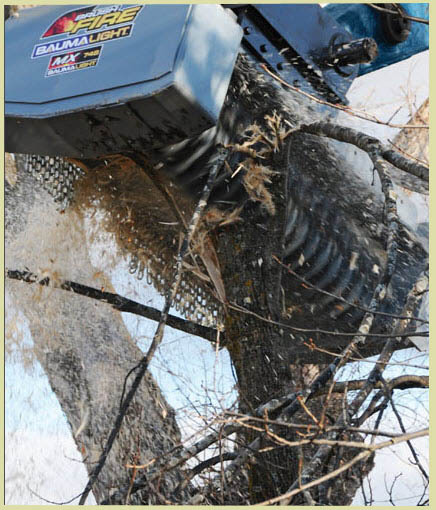 Model WLMS560-C540: Model MS560 mulcher with C540 hydraulic motor, requires 25-35 gpm hydraulic flow, requires case drain, hydraulic couplers NOT included, 60 inch cutting width/blade width, 75 inch total machine width, wt. is 2115 lbs. - Click the link below for the current price, and/or to order. 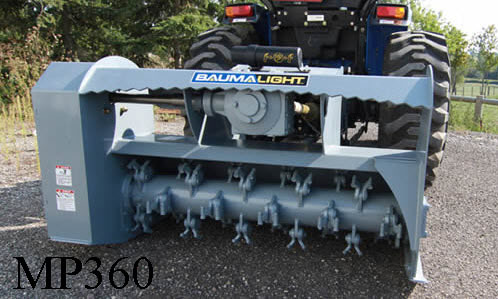 Model WLMS560-C550: Model MS560 mulcher with C550 hydraulic motor, requires 28-42 gpm hydraulic flow, requires case drain, hydraulic couplers NOT included, 60 inch cutting width/blade width, 75 inch total machine width, wt. is 2115 lbs. - Click the link below for the current price, and/or to order. 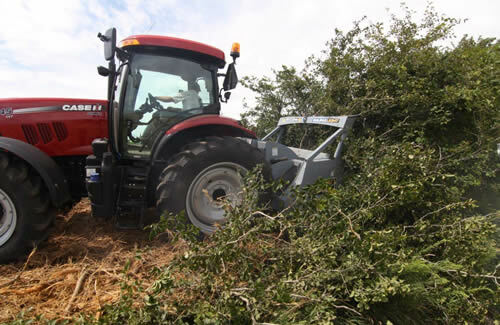 The 3 Series PTO powered Brush Fire Series brush mulchers bring large scale clearing power to small scale tractors. 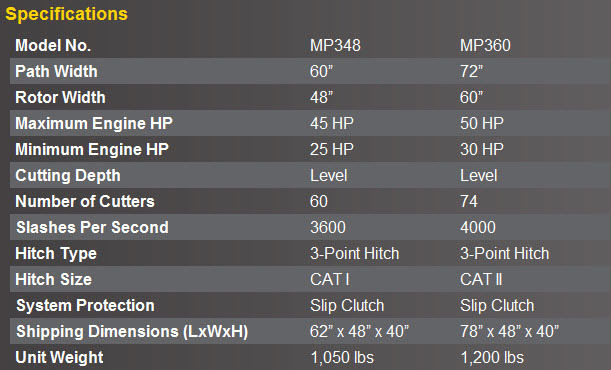 The WLMP348 and WLMP360 models are perfectly matched to your 25-50 hp tractor and mounting on your category 1 three point hitch. 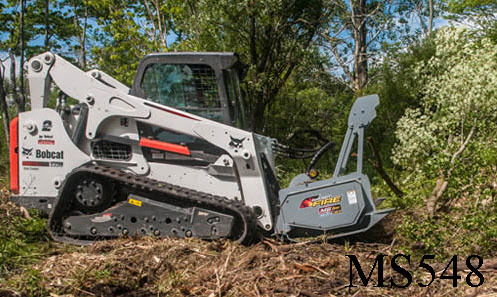 You can use these mulchers to blaze a trail or tame scrubs to make brush disappear. 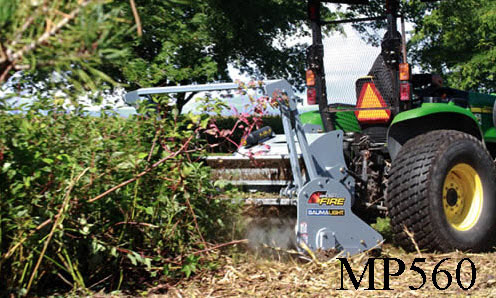 Model WLMP348: pto powered, tractor mounted (category 1 hitch) brush mulcher, 48 inch cutting width, maximum cutting capacity of 2 inches, weight is 1050 lbs. - Click the link below for the current price, and/or to order. 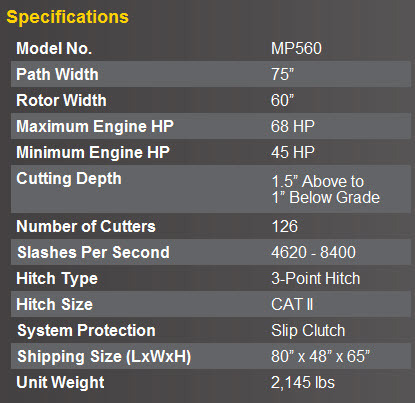 Model WLMP360: pto powered, tractor mounted (category 1 hitch) brush mulcher, 60 inch cutting width (total machine width is 72 inches), maximum cutting capacity of 2 inches, weight is 1200 lbs. - Click the link below for the current price, and/or to order. 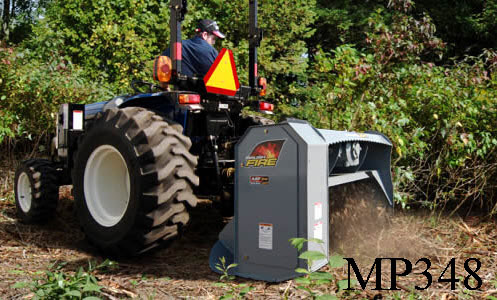 The model WLMP560 model is designed for mounting on category 2 hitches on tractors from 45 to 65 hp and is powered by your tractor's 540 rpm pto; this model cuts a 60 inch wide path. 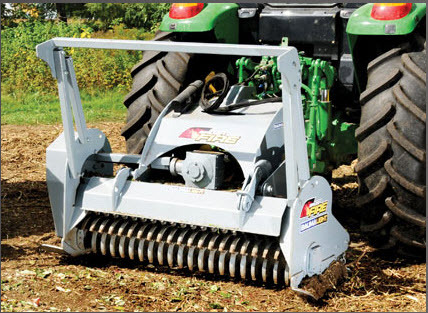 Model WLMP572 is designed for mounting on to category 2 three point hitches on tractors from 60 to 120 hp with 1000 rpm pto's; this model cuts a 72 inch wide path. 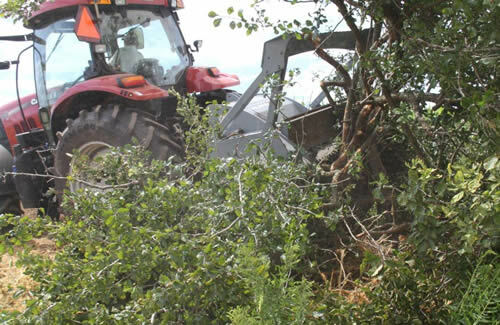 Model WLMP560: pto drive (540 rpm pto), three point hitch mount (category 2 hitch), brush mulcher, 75 inch overall width, with 60 inch cutting/rotor width, do not exceed 68 hp on gear box (for tractors from 45 to 65 hp), hydraulic couplers included, weight is 2145 lbs. - Click the link below for the current price, and/or to order. Model WLMP572: pto drive (1000 rpm pto), three point hitch mount (category 2 hitch), brush mulcher, 84 inch overall width, with 72 inch cutting/rotor width, do not exceed 125 hp on gear box (for tractors 60 to 120 hp), hydraulic couplers included, weight is 2500 lbs. - Click the link below for the current price, and/or to order. 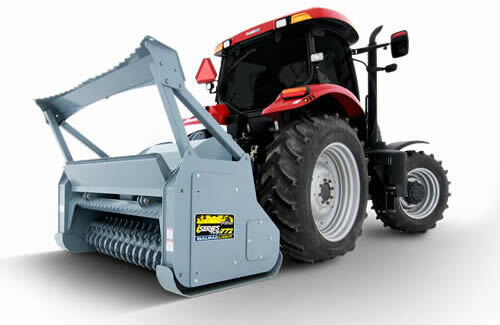 Model WLIMP772: Three Point hitch mount brush mulcher, mounts on large tractors with category 2 three point hitches, for tractors from 100 to 120 hp and not to exceed 135 hp maximum, for the pto shaft included, (for applications up to 165 hp see below), designed for 1000 rpm pto's, includes hydraulic couplers, 72 inch cutting (blade wide), overall with (path width) 84 inches, weight is 4100 lbs. - Click the link below for the current price, and/or to order. 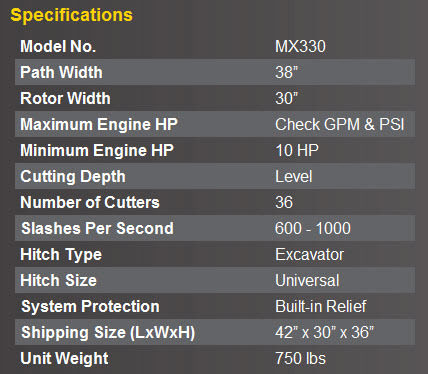 Model WLMX330: Model MX330 requires only 12-19 gpm to operate, no case drain required, hydraulic coiuplers NOT INCLUDED, 30 inch cutting / blade width, overall width is 40 inches, cuts materials up to 2 inches diameter, wt. is 750 lbs. - Click the link below for the current price, and/or to order. 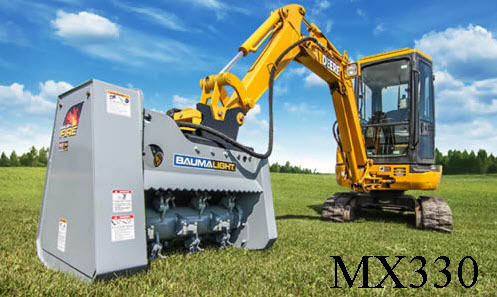 Model WLMX530-A450: Excavator mounted brush mulcher, hydraulic drive, requires 12-19 gpm, case drain required, hydraulic couplers NOT included, uses A450 motor option, has 30 inch cutting path, overall machine width is 40 inches, weight is 1036 lbs. - Click the link below for the current price, and/or to order. 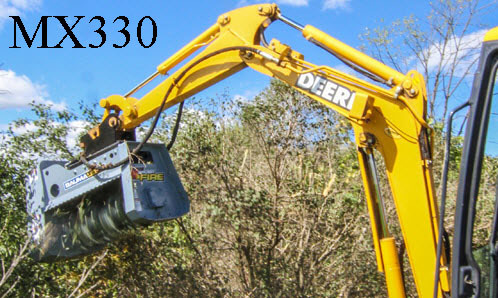 Model WLMX530-B550: Excavator mounted brush mulcher, hydraulic drive, requires 12-25 gpm, case drain required, hydraulic couplers NOT included, uses B550 motor option, has 30 inch cutting path, overall machine width is 40 inches, weight is 1036 lbs. - Click the link below for the current price, and/or to order. Model WLMX530-C510: Excavator mounted brush mulcher, hydraulic drive, requires 12-22 gpm, case drain required, hydraulic couplers NOT included, uses C510 motor option, has 30 inch cutting path, overall machine width is 40 inches, weight is 1036 lbs. - Click the link below for the current price, and/or to order. 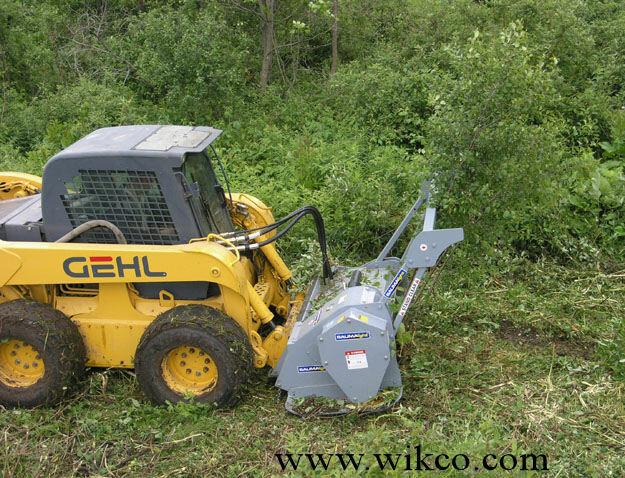 Model WLMX530-C530: Excavator mounted brush mulcher, hydraulic drive, requires 12-25 gpm, case drain required, hydraulic couplers NOT included, uses C530 motor option, has 30 inch cutting path, overall machine width is 40 inches, weight is 1036 lbs. -Click the link below for the current price, and/or to order. Model WLMX530-C540: Excavator mounted brush mulcher, hydraulic drive, requires 25-35 gpm, case drain required, hydraulic couplers NOT included, uses C540 motor option, has 30 inch cutting path, overall machine width is 40 inches, weight is 1036 lbs. - Click the link below for the current price, and/or to order. 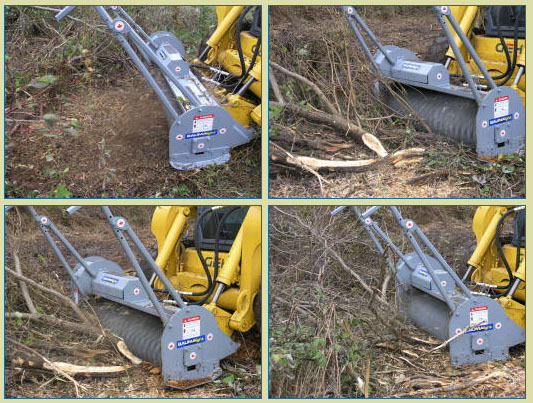 Model WLMX530-C550: Excavator mounted brush mulcher, hydraulic drive, requires 28-42 gpm, case drain required, hydraulic couplers NOT included, uses C550 motor option, has 30 inch cutting path, overall machine width is 40 inches, weight is 1036 lbs. - Click the link below for the current price, and/or to order. 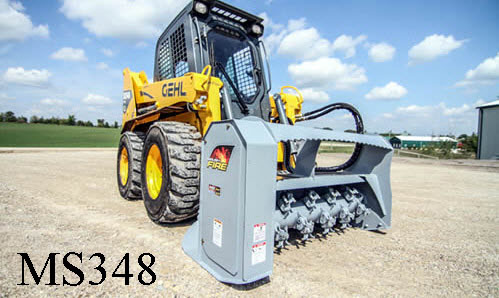 Model WLMX548-C530: Excavator mounted brush mulcher, hydraulic drive, requires 16-30 gpm, case drain required, hydraulic couplers NOT included, uses C530 motor option, has 48 inch cutting path, overall machine width is 65 inches, weight is 1670 lbs. -Click the link below for the current price, and/or to order. 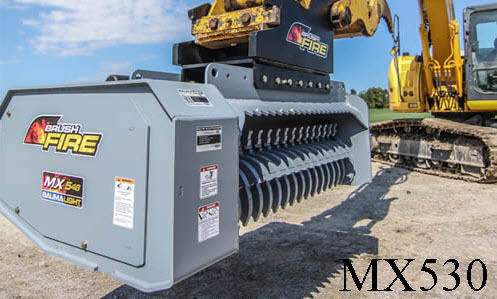 Model WLMX548-C540: Excavator mounted brush mulcher, hydraulic drive, requires 25-35 gpm, case drain required, hydraulic couplers NOT included, uses C540 motor option, has 48 inch cutting path, overall machine width is 65 inches, weight is 1670 lbs. - Click the link below for the current price, and/or to order. 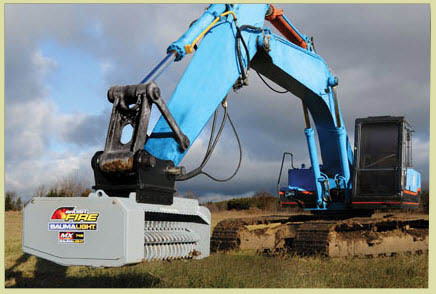 Model WLMX548-C550: Excavator mounted brush mulcher, hydraulic drive, requires 28-42 gpm, case drain required, hydraulic couplers NOT included, uses C550 motor option, has 48 inch cutting path, overall machine width is 65 inches, weight is 1670 lbs. - Click the link below for the current price, and/or to order. 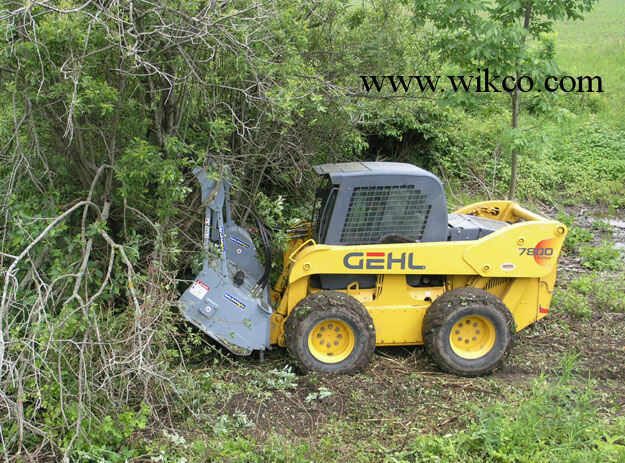 Model WLMX548-C570: Excavator mounted brush mulcher, hydraulic drive, requires 38-52 gpm, case drain required, hydraulic couplers NOT included, uses C570 motor option, has 48 inch cutting path, overall machine width is 65 inches, weight is 1670 lbs. - Click the link below for the current price, and/or to order. Model WLMX548-C590: Excavator mounted brush mulcher, hydraulic drive, requires 48-60 gpm, case drain required, hydraulic couplers NOT included, uses C590 motor option, has 48 inch cutting path, overall machine width is 65 inches, weight is 1670 lbs. - Click the link below for the current price, and/or to order. Model WLIMX748-C540: with C540 C-mount bent axis piston motor 25 to 35 gpm, 3000 to 4000 psi, rated for 1500 to 2100 rpm, requires case drain, hydraulic couplers NOT included, mulcher cutting path/rotor width is 48 inches, total mucher head width (path width) is 65 inches, weight is 3200 lbs. - Click the link below for the current price, and/or to order. 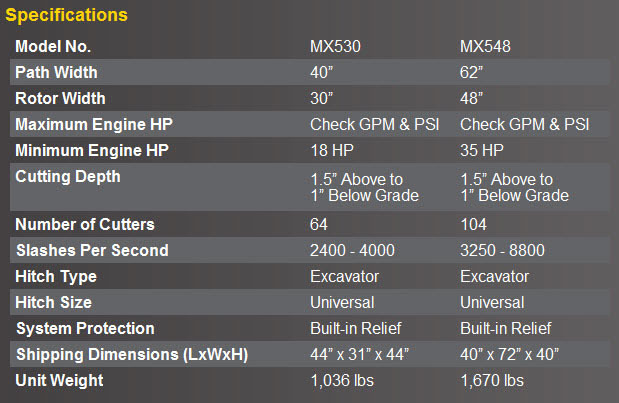 Model WLIMX748-C550: with C550 C-mount bent axis piston motor 28 to 42 gpm, 3000 to 4000 psi, rated for 1500 to 2030 rpm, requires case drain, hydraulic couplers NOT included, mulcher cutting path/rotor width is 48 inches, total mucher head width (path width) is 65 inches, weight is 3200 lbs. - Click the link below for the current price, and/or to order. Model WLIMX748-C570: with C570 C-mount bent axis piston motor 38 to 52 gpm, 3000 to 4000 psi, rated for 1500 to 2030 rpm, requires case drain, hydraulic couplers NOT included, mulcher cutting path/rotor width is 48 inches, total mucher head width (path width) is 65 inches, weight is 3200 lbs. - Click the link below for the current price, and/or to order. Model WLIMX748-C590: with C590 C-mount bent axis piston motor 48 to 60 gpm, 3000 to 4000 psi, rated for 1400 to 2200 rpm, requires case drain, hydraulic couplers NOT included, mulcher cutting path/rotor width is 48 inches, total mucher head width (path width) is 65 inches, weight is 3200 lbs. - Click the link below for the current price, and/or to order. THE EXCAVATOR MOUNT MULCHERS DO NOT COME WITH A MOUNT. MOUNTS MUST BE PURCHASED SEPARATELY BELOW. 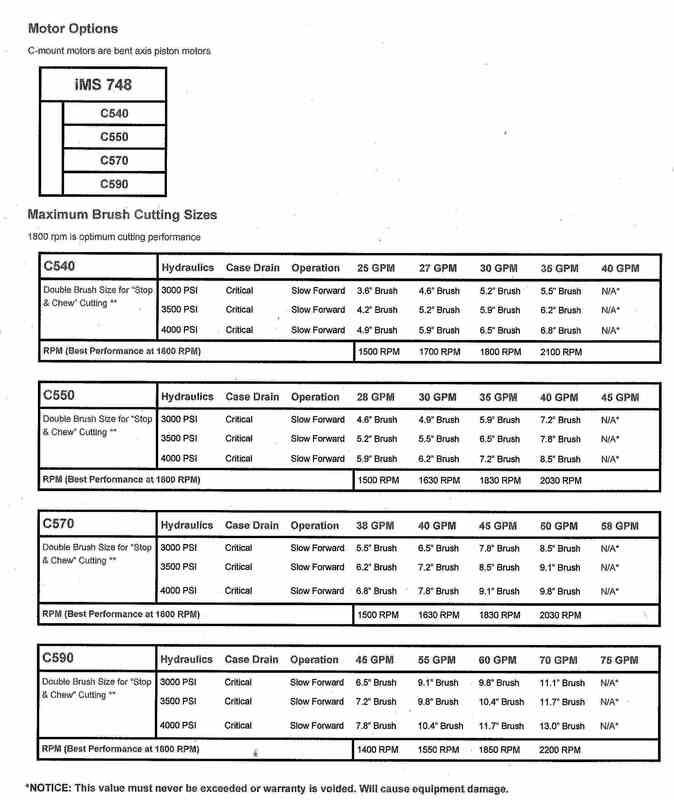 If you are ordering a mount with a new excavator mount mulcher then select the mount needed from the drop down menu on the mulcher order page to avoid extra shipping charges. Also available are the blank plate mounts; if you want to fabricate or purchase your own mount (the part that attaches to the excavator arm) you will need a plate to weld the mount to. 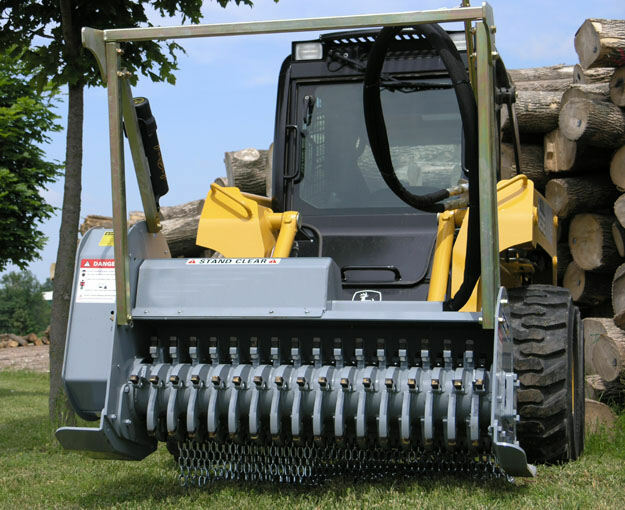 The blank plates bolt directly to the top of the mulcher head. 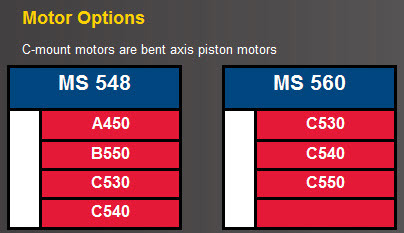 If you are ordering a replacement mount for a machine you already have, then click the order form button directly below this list. If larger than 30 tons gross weight, contact us for cost. Part No. D001161: Blank mounting plate to weld your own coupler/mount kit to, for the MX530 mulcher - Click the link below for the current price, and/or to order. Part No. D001499: Blank mounting plate to weld your own coupler/mount kit to, for the MX548 and MX748 excavator mount mulchersClick the link below for the current price, and/or to order. Part No. WLS1000-10: Box of 10 replacement teeth for all models, complete tooth, carbide tipped 7/8 inch long cutting tip with 5/8 inch threaded shank - Click the link below for the current price, and/or to order. Part No. WLS2001-10: Box of 10 replacement lock nuts, wt. is 0.2 lbs. each - Click the link below for the current price, and/or to order.